Cedar Heights condo nestled in the historic area of the lake! Offers a Spectacular Scenic View!! 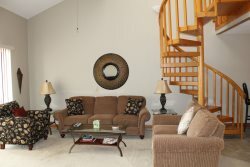 It is located on the 2nd level; with 2 flights of 8 stairs each going down from parking lot and has beautiful scenic view as well as lake view right from the screened in deck. The master bedroom has a queen size bed, full bathroom and a patio door leading out to the deck The second bedroom has 2 twin size beds with access to the main bathroom. Also a queen size sofa sleeper in the living room. While there you can enjoy WiFi, cable TV, on flat screens TVs in living room above and bedroom, gas grill, bar style patio table with 4 chairs, as well as 2 additional chairs with small table. The condo has ben recently remodeled and has all new furniture. - Golf Courses......and much more!! Please arrive at PMG Lake Ozark Vacations at 3524 Osage Beach PKWY Osage Beach, MO. 65065 between 4:00 and 5:00 to receive the keys to the reserved property as well as any and all necessary property information during business hours unless prearranged differently. If you'd like to request an earlier check in or late check out, please contact our office at 573.365.3800 the day before your arrival so that you can plan accordingly. In addition, if you will not arrive before the end of business (5:00 pm) on the date of your arrival please notify our office to arrange key pick up from our lock box located on the back side of our building which is a drive thru. Large vehicles, as well as boats and trailers, are not passable so please do not attempt, we are not responsible for any vehicle damages so use your own discretion. Please be sure that you provided our office with a cell phone number in order to reach you after hours in case of emergencies as well as for check in if you plan to check in between 5:00 pm and 8:30 am the following business day. You will be provided 24/7 emergency contact information at check in, please contact this number for any and all emergency reasons that include maintenance or housekeeping.